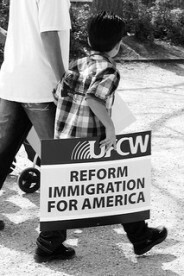 The 2012 U.S. presidential elections brought national attention to the Latino vote and, with it, immigration reform. Embarking on his second term, President Obama immediately labeled the matter a priority, and some but not all of the Republican leadership is eager to reach a deal. Beyond electoral calculations, there are many good reasons for Washington to finally resolve the status of roughly 11 million people living in the United States without legal documentation. The border with Mexico has become increasingly impermeable, stripping critics of reform of one of their principal talking points. Virtually all credible studies demonstrate that immigrants contribute more to the tax base than they receive from public expenditures, and they are a crucial source of community revitalization in some of the nation’s depressed cities and towns. Meanwhile, a generation of youth brought to the country as young children – the “Dreamers” – languishes without recognition of their de facto status as Americans. There are also humanitarian issues: families and neighborhoods are torn apart by the more than 400,000 deportations in each of the past several years. Immigration reform matters to Latin America as well. With millions of Latin Americans residing in the United States, several of the region’s economies are highly dependent on a steady flow of remittances, which are destined to increase if undocumented workers come out of the shadows. In 2012, Mexico and Central America received more than $35 billion from migrants in the U.S. Particularly striking is the case of El Salvador, a U.S. ally. Nearly a third of its population lives in the U.S., and remittances surpass all other sources of revenue – now 16 percent of GDP. For several Central American governments the welfare of migrants working in the U.S. is not only a humanitarian concern: these citizens are a crucial foundation for economic viability – and thus nothing less than a national security priority. Yet remarkably absent from the U.S. immigration debate are the implications of a comprehensive reform for the eroded credibility of the U.S. in Latin America. Virtually alone among senior officials, former Secretary of State Hillary Clinton acknowledged soon before leaving her post that creating a pathway to citizenship “will be a huge benefit to us in the region, not just in Mexico, but further south.” The point merits emphasis. The failure to enact comprehensive immigration reform, the result of domestic policy shortcomings, has serious consequences for U.S. standing in the region – as serious as other policy failures such as Washington’s continued inability to normalize relations with Cuba, to stop illicit gun exports, or to stem the demand for illicit drugs that is fueling violence and corruption across the region. If the new administration wishes to avoid a replay of the open rebellion by Latin American governments against U.S. policy that emerged at last year’s Summit of the Americas in Cartagena, it would do well to show the region that it is willing and able to enact comprehensive immigration reform.